In case of any questions or special requests, please do not hesitate to contact us at info@aquasana.sk or +421 918 574 473 . Aquasana water filter AQ 4000 is the easiest way to get clean and healthy water right from your tap. 3-stage under counter filter with a separate faucet and a 20 micron pre-filter for increased capacity. 2-stage filter with a separate faucet, removing more than 60 contaminants. Water is contaminated from various sources. Water is affected by increasing contamination of ground water, chemical contamination during processing (e.g. from chlorine disinfection), rust and other uncleanliness on the way to your home. Continuous usage of chemicals, pharmaceuticals, harmful disinfectants and increasing pollution makes water filtration an important factor in your healthy life style. Aquasana water filters remove 97% of chlorine & chloramines and over 60 contaminants while leaving beneficial minerals such as calcium, magnesium and potassium in the water. Aquasana filters have excellent results in independent testing such as Consumer Report or Consumers Digest. We are here for you, guaranteeing a refund in case you are not satisfied, offering support during installation and answering your questions. 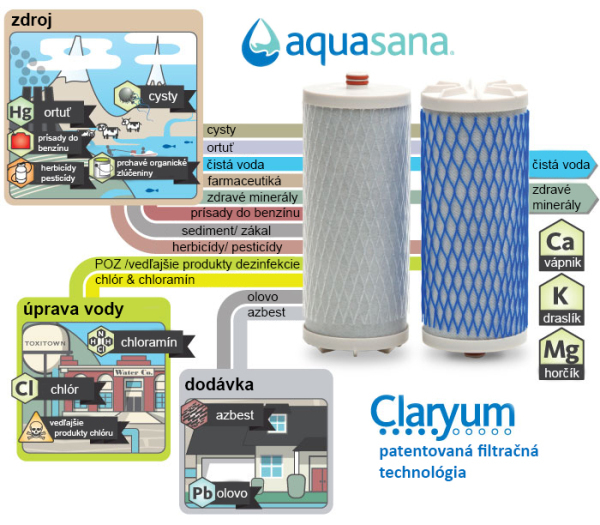 Variety of Aquasana filters offers a solution for everyone, from a simple shower filter to a design pitcher. Instead of buying bottled water, you can have clean water right from your tap for less that 2 cents per liter with Aquasana water filters.